However, I have found the time to have tea and pastries with two members of the French perfume forum Beauté-Test at the Salons du Palais Royal Shiseido, for the official launch of El Attarine. I am happy to report that the sample I received, and reviewed, earlier this summer, was indeed authentic. Secondly, upon more extensive skin and strip testing, the impression that this fragrance, like Serge Noire, is a sum of many previous compositions -- the Bois series, Santal de Mysore, Fleurs d'Oranger among others. On first sniff, the notes are so blended that they are difficult to pick apart. Then, as the fragrance develops, it gives off very different effects on our various skins -- proponents of the chemistry-doesn't-count be damned. On the fair-skinned redhead of our trio, the dried fruit came to the fore. On the fair-skinned brunette, a powdery, incense-laced benzoin emerges. On the olive-skinned brunette (myself), a woody, sandalwood and cedar base predominates. All smell quite differently than the strip. Cumin-haters may pick the spice out, but it's very well blended and didn't give off a sweaty or curry-like smell to our noses. It is in no way comparable to the spice-fest of Arabie. In addition, the rumours about the discontinuation of Miel de Bois are strenuously denied by the Palais. I started those rumours, and I offer my mea culpa to the three fans of the scent who felt the need to stock up. The info had been given to me by an S.A. in a major Parisian department store: quite possibly, some stores will stop stocking it because it sells poorly. Finally, those of you who've received the new wax samples (El Attarine, Encens et Lavande, Iris Silver Mist and Un Lys) may have noticed that the scents are no longer classified by family. This is Mr. Lutens' personal decision: he feels that all his fragrances belong to the Oriental family and should no longer be distinguished otherwise. I'll be doing one more post this week: then I'm off for the weekend to Barcelona, where I plan to visit the Museum of Perfume, and hopefully bring back a story. 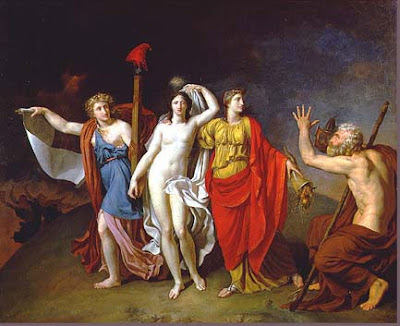 Image: Allegory of Truth (La Vérité amène La République et L'Abondance) by Nicholas de Courteille, 1791-92. Ah, what a lovely unifier for a tea. Three perfume mavens, all comparing notes whilst enjoying the repast. I'd be jealous, but I don't begrudge anyone who appreciates it such a delightful afternoon. Looking forward to a report from Barcelona! Scentself, it wasn't that it was hard to moderate, it's that it gave me so much to think about! When I re-read the comments and my answers, I wonder how we all came up with the stuff! Yes, it was lovely meeting up at the Palais Royal, and I was happy to put a (lovely) face on one of the forum members I hadn't met yet. I knew the other one from a work connection with my publisher... but we only found out about our respective perfumistadom through a third party! I don 't really understand, after reading about Miel de Bois discontinuation I called Palais Royal in Paris and they confirmed it was indeed being discontinued so after I bought three MdB bottles at Aedes. I hope this is a joke because I am very upset, I 'm calling Paris tomorrow again. Do you mean that the scents will no longer be characterized as they are on the website? I love those categories (Les Eaux Anciennes, Les Sumptueux, etc.)! I admire your commitment to journalistic integrity and responsibility as well, getting the word from the Palais and spreading it around. Merci! thanks for your diligent reporting on all matters Lutens-esque. And I'll be eager to hear about the Museum in Barcelona. I'm looking forward to a visit there myself, in November. Although I feel bad about Emmanuella's purchase I am very happy to read that MdeB isn't in danger of going anywhere. Emmanuella, I hope you don't think *I'm" the joker... I'm just reporting things as they are told to me, and I thought the Palais was the best source for the info: at shops around Paris, my friends and I have been getting "yes" and "no". But maybe the SAs have been instructed to deny discontinuation? This is deeply confusing. Please report back! Billy, that's right, they said "no more categories". As for responsibility, read Emmanuella's comment above: I officially don't know what's going on! Tom, I'm just throwing the towel on this one! (see above comments). Carmencanada, I don 't hold it against you but although I didn 't take it as just rumors either I called Palais Royal and the lady I spoke to confirmed Miel de Bois 's discontinuation. I just called Paris and spoke to Emily the boutique manager, she was confused, supposedly noone should have told me this MdB was being discontinued. Their marketing dept and Serge Lutens have been talking about it but eventually things look like it would be more likely they made Miel de Bois an exclusive than just discontinue it. She has my email and will let me know by the end of the year. Also about the reformulations, some of their fragrances have been reformulated but not all, at least that 's what they told her. I mentioned Fleurs d 'Oranger 's watered down reformulation, in the face of that she admitted they 've had complaints about it, they 've even had complaints about Ambre Sultan but "officially" the word is these two haven 't been reformulated. She promised to get back to me and tell me more. Ooooh! I'm the powdery, incense-laden benzoin skintype ;-P so I definitely have to try El Attarine. Brava, Emmanuella! So you wrenched the truth out of them, no mean feat! Well, the plot thickens, but I'd be inclined to think they would maintain Miel de Bois as an exclusive, just for the principle. Thank you for clearing up this matter as much as it can, at this hour. Mwah! March, you definitely need to try it. It's so unusual and beautiful, so quintessentially Lutens... Benzoiny-powdery is goooooooooooood. Dusan, I couldn't help it! I find that when reporting on new things, there's a bit of a rush to get out the review, especially in this case, when I had to make do with such a tiny sample. But there always new facets to discover. And after smelling it on three different occasions, I find that El Attarine is imprinted in my olfactory memory: a very good sign! D, I'm dying to hear what you think of the badly lit but bizarre bottle laden Perfume Museum in Barcelona, at the back of a very well-stocked perfume shop, next to Gaudi's Casa Battlo (or the other one, I forget -- don't go there, it's really a waste of $$!) I hope you can get an interesting story out of them at the Museum, no one really wanted to talk much when I was there, but I'm sure you'll know what to talk to them about, great perfume journalista that you are! Bon voyage!